The Fishing Buoy M3i with echo-sounder locates and monitors drifting, floating objects (FAD's), using satellite communications. Specially designed for tuna fishing, the buoy transmits GPS position, water temperature, battery status and echo-sounder information that indicates the presence or absence of fish under the FAD. M3i is equipped with double power supply system by rechargeable batteries by solar panels and back up package of alkaline batteries, which provides a theoretically unlimited autonomy and security due to its extra energy reserves. 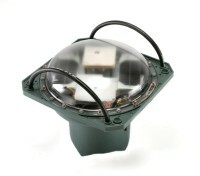 The buoy includes a 9602 SBD Iridium Transceiver with antenna, GPS receiver, temperature sensor, flash-light, electronic circuit with microprocessor, 500W echo-sounder with transducer, and magnetic (on/off) switch. The buoy has an easy to open design.